For other people named Carlos Correa, see Carlos Correa (disambiguation). Correa was drafted first overall by the Astros in the 2012 Major League Baseball Draft. An honor roll graduate of the Puerto Rico Baseball Academy and High School, he is the highest selection to come directly from a Puerto Rican high school. Correa is also the third Latino to be the first overall selection in the MLB Draft, after Alex Rodriguez and Adrian González, as well as the first Puerto Rican and Latin American-born player to do so. Correa was born in Ponce, Puerto Rico, to Carlos, Sr. and Sandybel Oppenheimer. The family had a low income but built a small house in Barrio Velázquez, a fishing village where he was raised. From an early age, Correa often played catch in an alley adjacent to his home, which prompted a neighbor to suggest enrolling him in a youth league, the parent-pitch category, when he was five years old. Correa was assigned to play first base due to his hitting ability, while his father continued training him every day during their free time. In 1998, Hurricane Georges caused heavy damage to the family's house. This forced his father to take several odd jobs, but he continued training Correa Jr. on a daily basis. Three years after the hurricane, he was performing solidly in Santa Isabel's Playita Cortada American Baseball Congress affiliate, hitting up to 150 home runs. When the team was eliminated, the league's champion, Rio Grande, recruited Correa to play in the championship series held in Atlanta. However, this move was difficult for the family due to the distance between Santa Isabel and the municipality of Rio Grande. His mother worked as well, but when this was not enough, she began selling food. The citizens of Santa Isabel began helping them organize charity games and his original team donated their sales income to help pay for the travel. Correa was Rio Grande's pitcher and was named the tournament's Most Valuable Player after striking out eight batters in a team comeback. By the time that he was 11 years old, the family was traveling to the municipality of Caguas to have him practice with higher-level teams. Correa was also an honor student and received a scholarship to attend Raham Baptist Academy. Three years later, the family moved from Barrio Velázquez due to recurrent floods, but kept close ties with those who stayed behind. Joined by his brother, Jean Carlos, in baseball practices, the family once again was forced to work more odd jobs. Soon after, the Puerto Rico Baseball Academy and High School (PRBAHS) brought Correa in as a scholarship student. His discipline and talent prompted his coaches to work extra hours to improve his bat and they helped by offering transportation when the family's car was totaled in an accident. In 2010, Correa participated in the Perfect Game BCS Finals and the WWBA PG Underclassman World Championships. After attending one of these Perfect Game events, Correa made adjustments to his batting swing with his hitting coach, José Rivera. The following year he appeared at the 2011 PG BCS Under-18 Finals and East Coast Professional Showcase. However, it was Correa's performance at the 2011 PG World and National Showcases that promoted him to the top of his class, earning him a spot in the Aflac-PG All-American Game, where he was named Rawlings' Defensive Player of the Year. He closed the year with an appearance in the PG WBAA World Championships. Correa opened 2012 by being selected the MVP in the Víctor Pellot Excellence Tournament, following an extraordinary performance for a shortstop that included a two-home run game. At the 2012 PG World Showcase, he established a PG record with a 97-miles per hour throw across the infield. After graduating from the PRBAHS with a 4.00 average as the class valedictorian and scoring 1560 on the SAT, Correa signed a letter of commitment with the University of Miami. 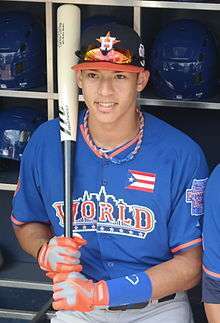 Besides competing for the PRBAHS, Correa was also a member of Team Mizuno and the Puerto Rico National Baseball Team that participated in the youth Panamerican tournament. Despite being the youngest high-profile player to enter the 2012 Major League Baseball Draft, in the months leading to the event the 17-year-old Correa was already projected as a top-ten pick by several major sources, including Sports Illustrated and ESPN. His stock rose during the month before the draft, with outstanding performances in team workouts, including one that reportedly left the Houston Astros' scouts "blown away". On June 4, 2012, the Astros selected him as the first overall pick, outranking the projected top pick, Mark Appel. Correa was incredulous, only stating that he must have been dreaming, after entering the stage while hoisting the Flag of Puerto Rico. With this selection, Correa became the highest-selected player to be drafted directly from a Puerto Rican high school, besting Ramón Castro's 17th pick in 1994, while joining several other Top-10 Puerto Rican picks such as Francisco Lindor, and Javier Báez, all of whom had moved to the United States to complete their high school or college education after developing in the local youth leagues. During the ceremony, he was congratulated by Puerto Rican great, Iván Rodríguez. Upon returning to Puerto Rico the following day, Correa was greeted by a victory parade in his native Santa Isabel, which was attended by hundreds of people. Correa signed with the Astros on June 7, 2012, agreeing to a $4.8 million signing bonus. Correa chose to wear the number 12 in his introduction to the media, donning it in homage to Hall of Famer Roberto Alomar, but abandoned it afterwards. The organization assigned him to their extended spring training team in Kissimmee, Florida. He began his professional career with the Gulf Coast Astros of the Rookie-level Gulf Coast League, and was promoted to Greeneville Astros of the Rookie-level Appalachian League. He opened the 2013 season with the Quad City River Bandits of the Class A Midwest League. Correa was ranked the top prospect in the Astros' farm system prior to the 2013 season and opened the year on a ten-game hitting streak that was halted by injury. Correa was selected the team's Player of the Month during this run and became the youngest player selected to play in the 2013 Midwest League All-Star Game, where he represented the Western Division All-Stars. Correa became the first player in the history of the All-Star Futures Game to be selected by popular vote to complete the World Team. He also became the first position player in the River Bandits' history to be selected in his first year with the team. The youngest player in the event, Correa entered the game as a defensive backup in the eight inning. Despite not having an official at-bat, his pre-game batting practice was scouted as impressive, including some home runs that reached the second deck of Citi Field. When Mark Appel joined the River Bandits in July, this marked the first time that two consecutive first overall draft picks played for the same minor league team. After the team prevented him from playing for Gigantes de Carolina in Puerto Rico, Correa began a training camp to improve his physique and add speed, which lasted from October to February. On January 14, 2014, the Astros invited Correa to spring training as a non-roster player. They assigned him to the Lancaster JetHawks of the Class A-Advanced California League to start the 2014 season. On June 21, Correa fractured his right fibula, requiring surgery that ended his season. He batted .325 in 62 games for Lancaster. The Astros invited Correa to spring training in 2015, and assigned him to minor league camp in late March to prepare for an assignment with the Corpus Christi Hooks of the Class AA Texas League. After Correa hit .385 in 29 games for Corpus Christi, the Astros promoted him to the Fresno Grizzlies of the Class AAA Pacific Coast League on May 11. In 24 games with the Grizzlies, he hit .276 with three home runs and 12 RBIs. On June 8, 2015, the Astros promoted Correa to the major leagues. He debuted in a 3-1 loss to the Chicago White Sox, going 1-for-4 with a RBI single off of Chris Sale. On June 9, 2015, Correa stole his first career base and hit his first MLB home run off of Zach Duke. By stealing three bases in his ninth game, he became the second-youngest player to do so in a century, only trailing Rickey Henderson by 21 days. Correa established a new franchise record for most hits during his first ten games by batting 14. He went on to also break the franchise record for most hits through 15 career games with 20. Correa set a franchise record for most doubles during his first 20 games, batting 9. Five home runs were also hit during this timeframe for a total of 14 extra-base hits, tied for the second-most since the 1993 MLB expansion. Correa also tied two other players by reaching base safely in 18 of these games. He won the American League's Rookie of the Month award for June. On July 5, 2015, Correa became the first player since 1914 to record five games with a minimum of three hits and a home run in 25 plate appearances since his debut. By his 42nd game he was leading the American League in home runs by shortstops. This game was also Correa's seventh with at least three hits, a record for rookies in this league. By hitting nine home runs during this timeframe, he also became the first shortstop in a century to accomplish this in his first 42 games. On August 1, 2015, Correa recorded his first multi-homer game, also setting a franchise record by hitting 12 home runs in his first 46 games. By his 50th game he had batted more home runs in that amount of games than any other shortstop in history, recording four more than the previous record-holder. On August 19, Correa delivered his first walk-off hit with a single off Tampa Bay Rays pitcher Matt Andriese. On October 12, 2015, Correa became the youngest shortstop to hit a home run in playoff competition, as well as the second youngest player to record a postseason multi-homer game. Following the conclusion of the season, Correa was selected as the Sporting News AL Rookie of Year. At the 2015 Players Choice Awards he received the AL Outstanding Rookie Award. On November 16, 2015, MLB and the Baseball Writers' Association of America (BBWAA) recognized Correa as the AL Rookie of the Year. He became the first Astro to win a Rookie of the Year award since Jeff Bagwell did in 1991. Correa began the 2016 season by becoming the youngest player in the Astros' history to hit a home run on Opening Day. ↑ "Astros make Carlos Correa top pick". ESPN.com. June 4, 2012. Retrieved June 7, 2012. ↑ Menéndez, Tony (June 4, 2012). "Carlos Correa: Próxima Estrella de Puerto Rico?" (in Spanish). La Página de Tony Menéndez. Retrieved June 7, 2012. 1 2 "Astros escogen al boricua Carlos Correa en el primer turno del sorteo" (in Spanish). El Nuevo Día. June 4, 2012. Retrieved June 5, 2012. 1 2 "Carlos Javier Correa:". MLB.com. June 8, 2015. Retrieved July 5, 2015. 1 2 3 4 5 6 7 8 "Carlos Correa Jr.:". MLB.com. June 8, 2015. Retrieved July 5, 2015. 1 2 3 4 5 "Carlos Correa Baseball Profile". Perfect Game. Retrieved June 5, 2012. ↑ Justice, Richard (June 4, 2012). "Correa too impressive for Astros to pass up". Major League Baseball. Retrieved June 7, 2012. ↑ Law, Keith (June 4, 2012). "MLB Mock draft 4.0". ESPN.com. Retrieved June 7, 2012. ↑ Perkin, Dave (June 4, 2012). "Buxton, Zunino follow Appel in SI.com's 2012 MLB mock draft". Sports Illustrated. Retrieved June 7, 2012. ↑ McTaggart, Brian (June 4, 2012). "Astros make Correa Draft's leading man". Major League Baseball. Retrieved June 6, 2012. ↑ Gammons, Peter (June 5, 2012). "Astros take bold step for long-term gain". Major League Baseball. Retrieved June 6, 2012. ↑ "Histórica selección" (in Spanish). El Vocero. June 4, 2012. Retrieved June 7, 2012. ↑ Fordin, Spencer (June 5, 2012). "Baseball Academy helped Correa blossom". MLB.com. Major League Baseball. Retrieved June 6, 2012. ↑ Cruz, Raisha (June 5, 2012). "Santa Isabel recibe a su "Pura Sangre"" (in Spanish). Noticel.com. Retrieved June 6, 2012. ↑ McTaggart, Brian (June 7, 2012). "Astros announce signing of No. 1 pick Correa". Major League Baseball. Retrieved June 7, 2012. ↑ Law, Keith (June 7, 2012). "Houston Astros ink No. 1 draft pick Carlos Correa for $4.8 million". ESPN.com. Retrieved June 7, 2012. ↑ Beltran, Mayra (June 12, 2012). "The No. 1 overall draft pick in the 2012 MLB draft began his first workout as a professional at the Astros' spring training complex Tuesday, June 12, in Kissimmee, Fla.". Houston Chronicle. Retrieved June 16, 2012. ↑ Marshall, Ashley (March 31, 2013). "2012 draftees to taste full-season ball". MiLB.com. Minor League Baseball. Retrieved March 7, 2014. ↑ Pleskoff, Bernie (July 13, 2013). "Brightest talent stands out at Futures Game". Major League Baseball. Retrieved July 14, 2013. ↑ Batterson, Steve (July 23, 2013). "Correa turns heads in batting practice". Quad Cities Times. Retrieved July 14, 2013. ↑ LaNave, Marco (July 19, 2013). "Bullpen, offense boost Bandits over TinCaps, 6-3". Major League Baseball. Retrieved July 20, 2013. ↑ Batterson, Steve (July 10, 2013). "Top pick Appel to make history with Bandits". Quad City Times. Retrieved July 20, 2013. ↑ Rosa, Carlos Rosa (February 11, 2014). "Convertido en una máquina Carlos Correa" (in Spanish). El Nuevo Día. Retrieved February 13, 2014. ↑ McTaggart, Brian (January 29, 2014). "SS prospect Correa brings loads of potential to camp". Major League Baseball. Retrieved February 13, 2014. ↑ "Mark Appel, Carlos Correa to start at Class A Lancaster". Ultimate Astros. Houston Chronicle. April 2, 2014. Retrieved June 26, 2014. ↑ Wild, Danny (June 25, 2014). "Astros' Correa to miss remainder of season". MiLB.com. Retrieved June 26, 2014. ↑ Maun, Tyler (March 29, 2015). "Astros send top prospect Correa to Minors: Shortstop expected to begin the season with Double-A Corpus Christi". MiLB.com. Retrieved March 30, 2015. ↑ Maun, Tyler (April 7, 2015). "Texas League Preview: Top Houston Astros prospects Mark Appel, Carlos Correa ready to lead Corpus Christi Hooks Hooks". MiLB.com. Retrieved April 7, 2015. ↑ Clement, Ron (May 11, 2015). "Astros promote former No. 1 pick Carlos Correa to Triple-A Fresno". Sporting News. Retrieved May 11, 2015. ↑ "2015 Fresno Grizzlies Statistics". Baseball Reference. Retrieved June 8, 2015. ↑ "Carlos Correa, No. 1 pick in 2012 draft, to join Astros on Monday". espn.com. June 8, 2015. Retrieved June 8, 2015. ↑ McTaggart, Brian. "Correa hits first home run, steals a base.". mlb.mlb.com. MLB.com. Retrieved June 8, 2015. ↑ "Correa sprints to record books with 3 steals". Major League Baseball. Retrieved July 6, 2015. ↑ "Correa ignites power surge as Astros top Rox". Major League Baseball. Retrieved July 6, 2015. ↑ Fox Sports. "Luis Valbuena, Carlos Correa power Houston Astros to 13-3 rout of Los Angeles Angels". FOX Sports. Retrieved July 6, 2015. 1 2 AP (June 28, 2015). "Rookie Correa leads Astros over Yankees 3-1". USA TODAY. Retrieved July 6, 2015. ↑ Rob Foldy/Getty Images. "Hit and Run: Zack Greinke gets runs, Carlos Correa keeps it 100 - MLB - SI.com". SI.com. Retrieved July 6, 2015. ↑ "Red-hot June nets Astros' Correa Rookie of the Month honors". FOX Sports. July 3, 2015. Retrieved July 6, 2015. ↑ "Twitter". twitter.com. Retrieved August 4, 2015. 1 2 3 Evan Drellich (July 28, 2015). "Carlos Correa atop AL shortstop power rankings after hitting ninth homer of season". Houston Chronicle. Retrieved July 29, 2015. ↑ Chandler Rome (August 2, 2015). "Correa continues ascent with first 2-HR effort". MLB.com. Retrieved August 2, 2015. ↑ Paul Casella (August 6, 2015). "DYK: Facts, stats from Correa's 1st 50 career games". MLB.com. Retrieved August 7, 2015. ↑ Bill Chastain and Brian McTaggart (August 20, 2015). "Rays pitch to Correa; rookie's reply ends game". MLB.com. Retrieved August 24, 2015. ↑ Matt Snyder (October 12, 2015). "Carlos Correa becomes youngest shortstop to ever homer in playoffs". CBS Sports. Retrieved October 12, 2015. ↑ "Carlos Correa Named Sporting News AL Rookie Of The Year". Retrieved December 21, 2015. ↑ "AL Outstanding Rookie: Correa". Major League Baseball. Retrieved December 21, 2015. ↑ "Carlos Correa es el Novato del Año de la Liga Americana". El Nuevo Dia (in Spanish). Retrieved December 21, 2015. ↑ Brian McTaggart (April 5, 2016). "Young upstart: Correa revs Astros in lid-lifter". MLB.com. Retrieved April 5, 2016. Wikimedia Commons has media related to Carlos Correa.